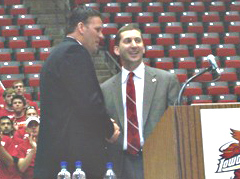 Greg McDermott with ISU AD Jamie Pollard after being named Cyclone coach 4 years ago. Greg McDermott was introduced this morning as the new head coach at Creighton. McDermott resigned as the Iowa State coach on Monday and replaces long-time coach Dana Altman at Creighton. Altman was named the new coach at Oregon on Monday. McDermott says when he took the Wayne State job 14 years ago they were coming off a 7-20 season, and he says U.N.I. was 7-24 when he took that job. He says they were truly rebuilding jobs, but he says Creighton is not. McDermott says Altman did an unbelievable job building the program to the level it is, and knows he has big shoes to fill and he takes that very seriously. McDermott says he is happy to be back in the Missouri Valley Conference. McDermott led U.N.I. to three straight NCAA Tournament appearances before taking over at Iowa State in 2006. He says it is a league where the teams care about each other and the decisions that are made are in the best interest of the league and sometimes you have to put your own interests aside. McDermott will also get a chance to coach his son at Creighton. Doug McDermott helped lead Ames to back-to-back 4A state championships and will join the Creighton program after originally signing with U.N.I. McDermott says they both talked to U.N.I. coach Ben Jacobson and says he was “100-percent in support of Doug having the opportunity to play for me.” He says there is a process to go through, but he is confident that will not be a problem because of Jacobson’s support.